The subscribers included the Prince of Wales, the Duke of Portland, the Duke of Rutland, the Duke of Somerset, the Duchess of Newcastle, the Duchess of Sutherland, the Bishop of Peterborough, the Earl of Hopetoun, Major Ashton, Mr Hedworth T Barclay, Mr H Boden, Lord Belper, Mr and Mrs Cecil Chaplin, Mr G Coates, Mr A Coates, Lord Crawshaw, Mr Arthur Coventry, Mr Ernest Cassel, Mr E L G Cooke, Lord Churchill, Mr A L Duncan, Lord Dudley, Mr Edwin de Lisle, Mr Everard de Lisle, Mr Walter de Winton, Capt J Orr-Ewing, the Earl of Essex, Mr Granville Farquhar, Captain H Keith Fraser, Sir R Fitz-Herbert, Sir Gilbert Greenall, Lady Gerard, Captain Burns –Hartopp, the Earl of Harrington, the Hon Gavin Hamilton, Sir Frederick Johnstone, Mr R M Knowles, Lord Kenyon, Mr A C Lucas, the Right Hon Walter Long, Mr F Laycock, the Hon Lancelot Lowther, Captain W Lawson, the Earl of Lanesborough, Emily Countess of Lonsdale, Lord Edward Manners, Captain the Hon H Molyneux, Lord Manners, Mr Russell Munroe, Lord Newark, Sir Ernest Paget, Mr Walter F Paget, Mr H B Praed, Mr W B Paget, Major Paynter, Hon Alan Pennington, Lord and Lady Henry Paulet, Lord William Bentinck, Lord Henry Bentinck, Sir John Rolleston, Sir Samuel Scott, Lord Percy St Maur, Lord Ernest St Maur, Lord Trevor, Hon Mrs Tennant, Major Tennant, Mr T P Trew, Lord Henry Vane Tempest, Hon L Tollemache, Baron Max de Tuyll, Mr E H Warner, Lady Warwick, Captain Warner, Countess of Wilton and Mr A V Pryor, Captain Gordon Wilson, Marquis of Worcester, Marchioness of Worcester, Mr Clarence Wilson, Major the Hon G Bouverie, Mr Frank Behrens, Sir Francis Burdett, Captain Boyce, Mr F Charrington, Sir Walter Corbett, Colonel the hon N Curzon, Lady Georgiana Curzon, General Chippendale, Mr Noel Fenwick, Mr Cecil Grenfell, Mr W J Hubbersty, Lady Hartopp, Hon W Lambton, Captain Carter O’Neal, Colonel O’ Shaughnessy, Mr Hugh Owen, Sir Archdale Palmer, Major Stirling, Mr A J Schwabe, Mr G Murray Smith, Capt A G Smith, Capt Sherbrooke, Mr Sloan Stanley, Mr W H Winterbottom, and Mr W Younger. 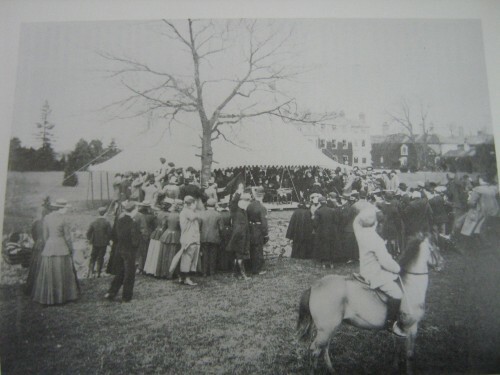 The proceedings took place under a marquee erected near the hall, Lord Belper, as chairman of the committee, making the presentation. Addressing the company, he said they all knew the reason for which they had come there that day. He had been asked, as chairman of the Quorn Hunt Committee, to present the testimonial to their late huntsman and friend, Tom Firr (Applause). He saw many around him who would have performed that duty much better, and might have been more fitly asked to do it (“no, no”) But he could at least say that no one valued the privilege of taking part in an occasion like that more than he did, when they had come to do honour to one who had been so closely associated with the success of the Quorn Hunt for so many years and had won the esteem and admiration of all who had had to do with hunting in this country. (Applause). He thought he was right in saying that it was 27 years ago when Tom Firr was first introduced into this country by the then master, Mr F Copeland, Previous to that he had been huntsman for Warwickshire. He also believed he was right in saying that no huntsman ever held the position for so long. But whether that was correct or not, he was sure no one would contradict him when he said that no one had ever shown the same sport in the country as Tom Firr during the time he had filled the duties of huntsman. (Hear, hear). profound regret, and one and all felt it a matter deeply to be deplored that one so long associated, and so successfully, with the Quorn Hounds, should have to give up his duties (Hear hear). He did not intend to keep the company there while he expatiated on what would take him hours, if not days, reminding them of all the pleasant and happy days they had had while Tom Firr had been huntsman, and the good sport he had shown them. It would be an insult to him and to them to try and point out he qualities that had made him so successful. None of them would forget for many years that fine and perfect horsemanship, coupled with unfailing nerve, which always enable him to be close up to the hounds, an show them the way where many of them were glad if they could follow him; the patience and perseverance he always showed in trying circumstances, which enabled him to turn an almost hopeless day into a brilliant success, and, above all, what was more difficult to describe, the power and faculty of doing the right thing at the right moment, and doing the right way and bringing his knowledge and experience to bear in a moment, and showing that touch of genius which alone made him one of the cleverest expositors of the art of hunting (Applause). There was one other point he would like to call attention to, among the qualities which had made him so successful in this country, and had made the name of Tom Firr recognised by all hunting men in all parts of England as one of the most successful huntsmen who ever carried the horn. That was that during all this time he had never made an enemy. (Hear , hear.) His high character and his straightforward conduct had not only won him respect from all, but had gained for him many warm friends among those who had been most closely connecte with hunting in this country. (Applause). And now, continued Lord Belper, it was his duty – one which he wished could have been postponed to a far later day – to present Firr, on behalf of the numerous subscribers, with the testimonial which had been collected during the last few weeks. He assured him that he did not think there ever had been a testimonial more readily and cheerfully subscribed to that this had been, and although Mr Cradock was very kind in assisting as secretary his duties had been very light, for everyone had come with hearty expressions of goodwill to help in giving something which would be of assistance to Firr now he had retired. There were 380 subscribers, not only gentlemen who were now hunting with the Quorn, but many who had enjoyed the good sport he had shown them in times past. The sum collected was over £3,200, and he (Lord Belper) had now to present a cheque for that amount. He would like to say, as there might still be some who wished to subscribe, that the list was not yet closed, and if anyone wished to contribute their contributions would be thankfully received and would be added to the sum to be presented that day. He also had to present Firr with a silver salver, as a small remembrance of the long and honourable service he had filled with the Quorn, with the hope that it would recall to him many pleasant days, and remind him that his work and service with this hunt had been warmly appreciated by all who knew him. In presenting him with this testimonial, he could only say, on behalf of the subscribers, that it was with most hearty good wishes for him that they had subscribed it. They hoped it would be of some use to him in the future, and in presenting it he (Lord Belper) assured him of the most heartfelt wishes of himself and all the subscribers, that there might be many happy days in store for him, and that he might be completely restored to health, and live a long and useful life. (Loud applause). Captain Warner, and old Master of the Quorn, under whom Mr Firr had served, said he had been asked to say a few words, and associate himself with this presentation. He looked upon it as a very great honour to be asked, but after the eloquent speech of Lord Belper there was nothing left for him to say. He could only repeat the hope expressed by Lord Belper, that Firr would soon be restore to health, and enjoy many years of prosperity (Hear , hear). Mr Firr was enthusiastically cheered on rising to respond. He said he thanked them most sincerely. It would be impossible for him to find words to return thanks in anything like a suitable or proper manner, as he would wish, for this handsome testimonial. He felt that his thanks were due in so many ways. He would like to return thanks for the kindnesses received on all sides for over a quarter of a century. And he would like also to return thanks for the thoughtful kindness which was shown to him after he got his last fall, for in addition to the many who called, he had hundreds of telegrams and letters of inquiry and sympathy from all parts of the United Kingdom. All those were acts of kindness which could not be forgotten. He would like also, as he would not have another opportunity, to thank the farmers of the Quorn county over whose land it had been his duty to ride for so many years for the great respect they had always shown towards him (Hear, hear). In making this presentation, Lord Belper had used many kind words, and (Mr Firr) only hoped he deserved them. It certainly had been his study and duty, and a very pleasant duty, to strive to the utmost of his power to give satisfaction to each of his different masters, some of whom, he was exceedingly proud to see present that day, and to show the best sport he possibly could to the large fields of ladies and gentlemen who had come out. It was most gratifying to him to hear that he had, to a certain extent, succeeded . (Hear, hear). He was engaged to come to Quorn very early in 1872, and when the news got about in the country where he then was, and it was known that he was leaving, he was told on all sides, by undoubted friends, that the had made a very great mistake in leaving a country in which he could give satisfaction to go to one where it was most difficult to do so. He used to talk the matter over with his wife, and said that he was engaged to go to Quorn and must go, and must do his best, and if he could not give satisfaction he must try somewhere else. He came, and the result was that he had been there 27 years, had had a great deal of happiness, and this most handsome testimonial to wind up. Although this duties as huntsman of the Quorn were ended, for which he was exceedingly sorry, he hoped to derive much pleasure from thoughts of the past. He should from time to time, look through, with the greatest pride, the list of the ladies and gentlemen who had been kind enough to subscribe to this testimonial, and that, he was sure, would be the crowing point to those thoughts of happiness to which he had alluded. Captain Burns-Hartopp, the Master of the Quorn, then led a round of cheers for Firr, with which the proceedings ended. The Hunt then moved off in the direction of Quorn Wood.